For those interested in Android development, I though I can share my experience setting up Nook Color for Android development. One of the reasons the Nook Color is appealing to me is because the price is relatively inexpensive and because I want to test apps on a modest processor. Disclaimer: this is not a rooting guide, and I am not even saying rooting is not risky, because it is. It may make a device behave strangely, turn it into a brick, and so on. 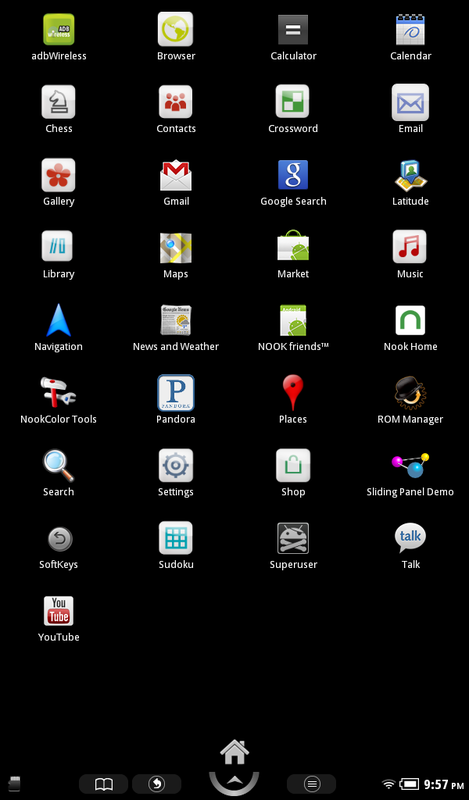 But I want to share this experience as also to say that: yes, Nook Color is a cool Android device. 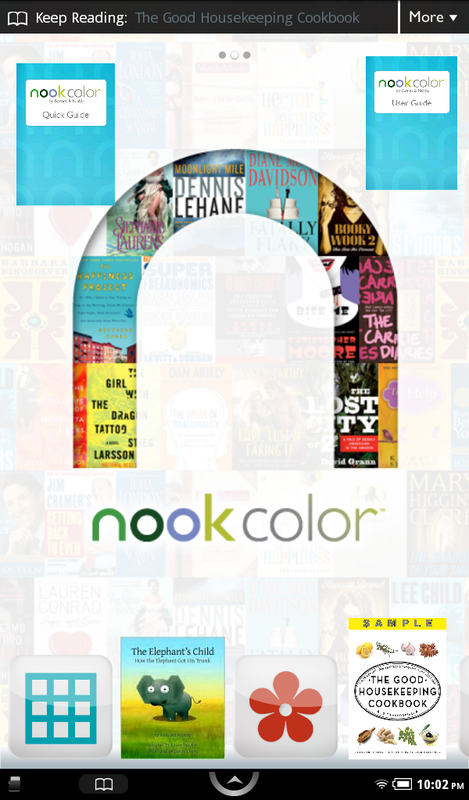 I signed up, downloaded and installed the Nook Color SDK (https://nookdeveloper.barnesandnoble.com/ or https://nookdeveloper.barnesandnoble.com/tools-services/sdk.html). Being a registered user is not the same as being a registered Nook Developer as being a registered Nook developer requires a different registration and an approval process. The requirements seem hefty and I don’t know if I would be accepted when I do apply. I can understand not allowing just any kind of app ala Android Market because they want to maintain quality control and also because not all app will run well on the device (considering the tall dimensions and specifications), but you’d think they’ll be following APple process where they review applications instead of developers. After getting the SDK running (it has a nice Nook Color emulator), I tried to use the real device out of the box (basically I thought I would be able to run compiled code through Eclipse via ADB connected to the device). This turns out to be an impossible task and I wasted around four hours trying to get this to work. There’re several questiona about this which either are unanswered or vaguely answered at the time of this writing. Rooting is something that I didn’t want to do so I struggled not to do it, but in the end, My conclusion was: I wasn’t able to get it to work without rooting it. And ironically, the process of rooting it actually took less time than the fruitless attempt at trying to get ADB to work without rooting. I followed these guides after researching several hours. Note that these guides seems to assume that the reader is familiar with rooting, which I am not. I couldn’t understand some of the terms used, and even those refers to a different versions. Copied the zip above into the MicroSD card. 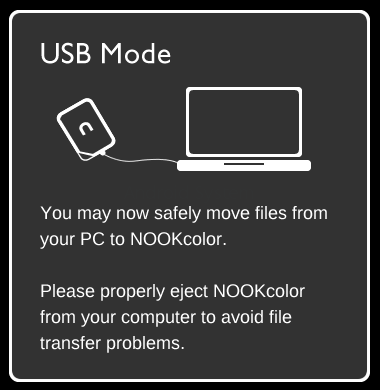 Unloaded the SDCard from the PC and inserted it into the Nook Color. A menu should come up. 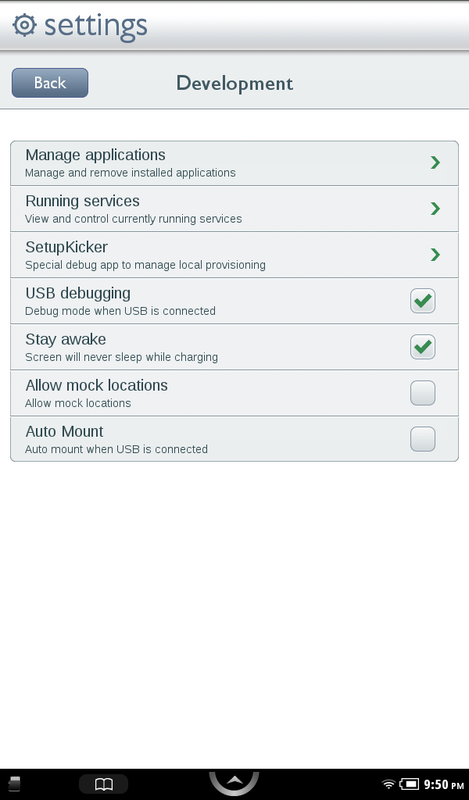 Following that, the Nook Color ADB driver needs to be installed. I initially had issuew with following the instruction at: http://nookdevs.com/NookColor_USB_ADB, so I also tried this: http://forum.xda-developers.com/showthread.php?t=882751 — the batch file was useful. Another nuiscance is this dialog often reappears when connecting the Nook to Computer with USB. This dialog is modal so the Nook screen does not work. The solution is to turn off Auto Mount again (for some reason, this always reset when I restart Nook). To close with, let’s be clear that this is not a how-to guide, because frankly I don’t want you to risk your device by rooting it. I suggest checking out the links that I mentioned throughout if you want more details. There are warnings all over: rooting may void your warranty, may cause the device to malfunction or break it altogether. 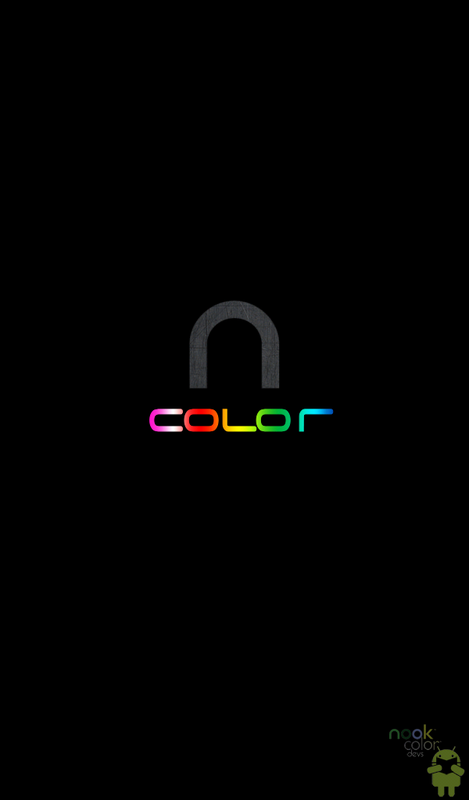 Update: I got a looping Nook Color logo at one point and had to restore the factory setting. This guide did work for me and re-rooting solved the problem. Update: If you just want to be able to download apps, there’s now the N2A options at http://www.n2acards.com/. They have some microSD card which can be used to boot into Android or the default Nook Home.